Let’s talk about the last two sentences there. 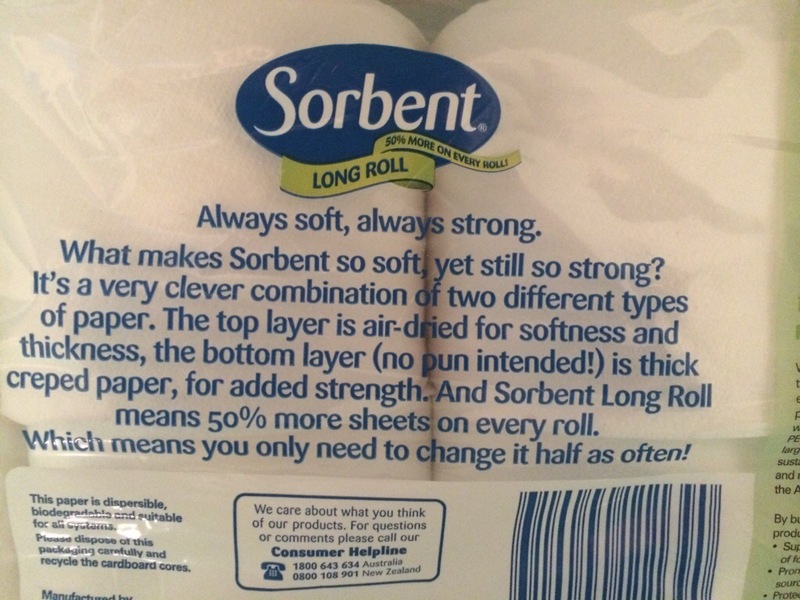 If a Sorbent Long Roll has 50% more sheets on every roll, then you need to change it two-thirds as often, not half as often. I know you are a toilet paper company, and not the Australian Bureau of Statistics. But I feel that this sort of dishonest marketing may have just been an honest mistake, so I’ll explain it for you. Let’s suppose a regular roll has 100 sheets, and I use on average 5 sheets per day. This means you would expect me to replace the roll after 20 days (20 days = 100 sheets / 5 sheets per day). If a Long Roll has 50% more, then it has 100 sheets + 50% of 100 sheets = 150 sheets total. Cool! But I’m still using 5 sheets per day. Therefore I will change the roll after 150 sheets / 5 sheets per day = 30 days. In 60 days time, I will have used three regular rolls of 100 sheets, or two Long Rolls of 150 sheets. That means I’m replacing the Long Rolls two-thirds as often as the regular ones. Note that you can swap out the size of a regular roll and the rate of use, and the maths still works out (as long as you’re consistent)—a Long Roll, if it has 50% more sheets than a regular roll, will be replaced two-thirds as often. In reality, we don’t use toilet sheets at a fixed rate, so your mileage may vary (no pun intended). But I would contend hypothetically that the availability of more toilet paper would encourage people to use it more quickly. This means in practice that Long Rolls get replaced even more often than two-thirds as often as regular rolls. PS: The plus symbol + is a valid character in the email field, but your form rejected it. Please refer to internet RFC 822 (issued in 1982) as the relevant standard .